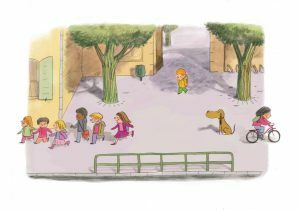 His lonely way to school saddens the little boy’s heart every morning. There are so many things scaring him. The dark tunnel. The fierce old man. But one afternoon someone is waiting for him in front of the school. A nice guy with floppy ears and an amazing friendliness. It’s a big dog who, from that moment on, hovers over the little boy and becomes his faithful companion. With the new friend at his side, the little boy starts growing more courageous and confident every day. A touching story without words.